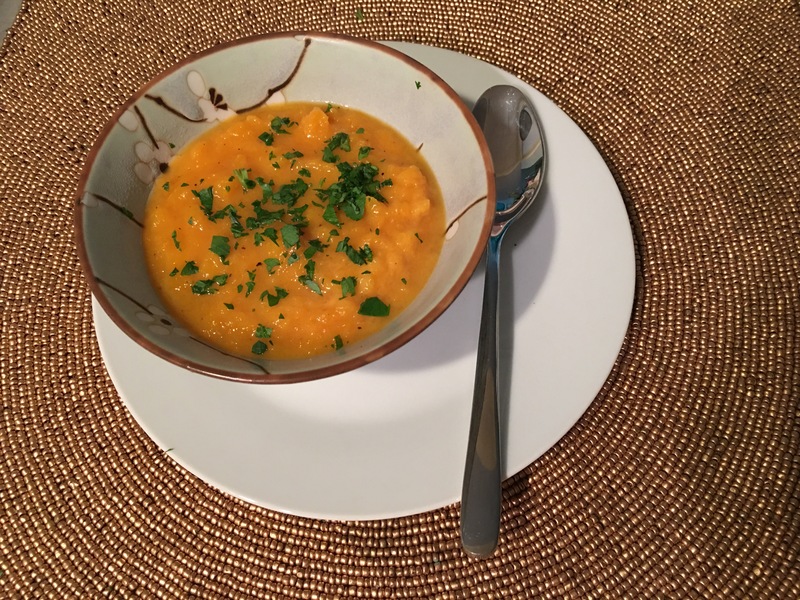 Butternut squash soup – Hurried Home Chef! This is the soup that I will do in a two day process, because it is time consuming to make it from scratch. I start the evening before when I am cooking dinner because the oven is doing all the work. 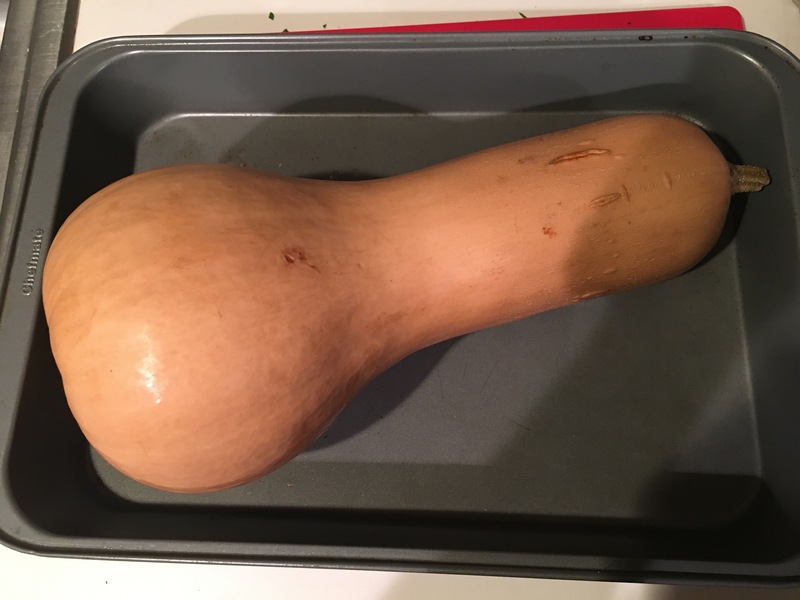 I thoroughly scrub the outside of the squash with soap and water. Then place in a pan, brush on some oil, and bake at 350-375 for about an hour. 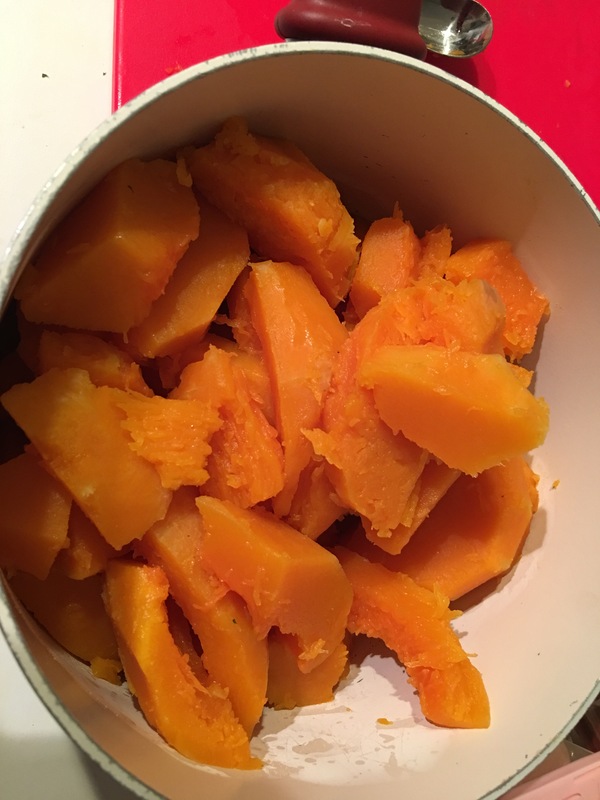 I test it with a knife, which was soft like a baked potato. I was busy doing other things, so I turned off the oven and left it in for another 20 minutes or so. 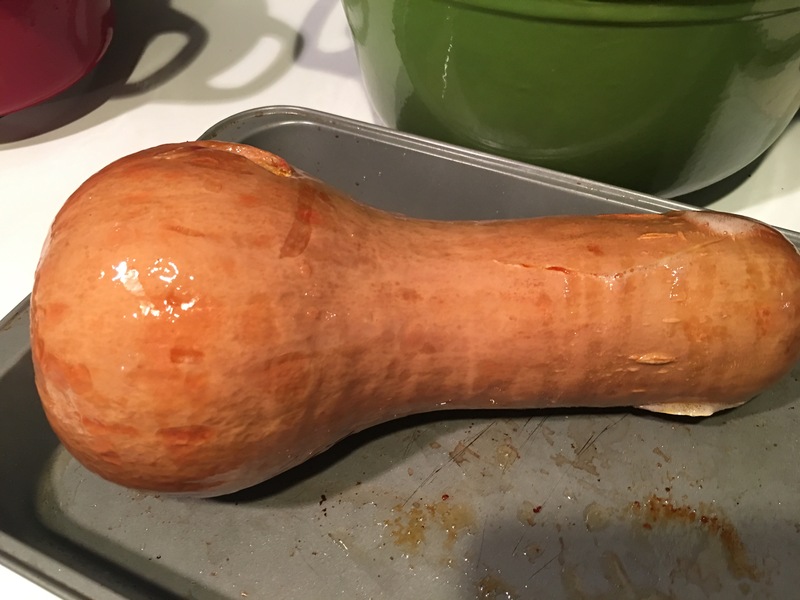 You can’t really over cook squash when you are making soup. 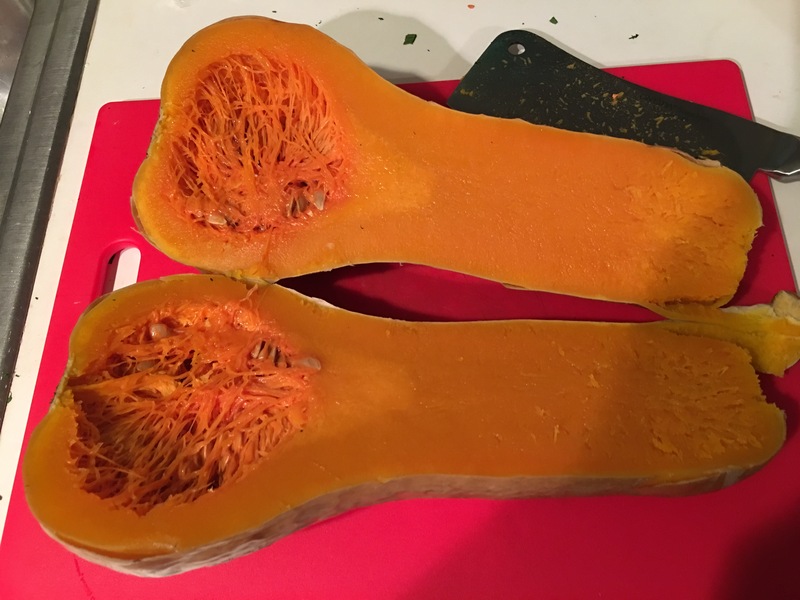 Cut it in half, scoop out the seeds, cut into larger pieces, then peel it and dice into a pot. At this point I put the entire pot in the fridge and went to bed. Next day, take out of the fridge, even if you’re not ready to use it right away, let it come up to room temperature while you’re doing other things. Or you can just put it right on the stove. Add some chicken stock (or veg if you want to keep it vegan) and cover it on medium to medium high heat. You will need to intermittently take a potato masher and break it down, try to keep some texture to it though. As for spices to add in, I like it more savory than sweet, so I add salt, curry powder, and some heat like cayenne or Sriracha. 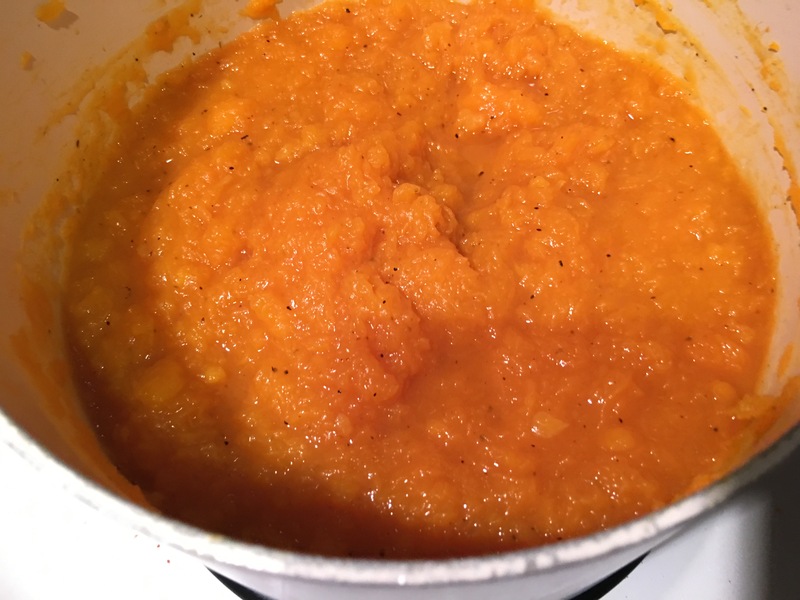 Depending on how you like the soup, you can add more liquid. I happened to have half and half in the fridge, so I used some. Top with fresh parsley, sage, or rosemary. If you like a little crunch you can crumble some tortilla chips, croutons, toasted pine nuts, etc. You can also add some chicken or quinoa for protein.